Explanation: Why does this starfield photograph resemble an impressionistic painting? The effect is created not by digital trickery but by large amounts of interstellar dust. Dust, minute globs rich in carbon and similar in size to cigarette smoke, frequently starts in the outer atmospheres of large, cool, young stars. The dust is dispersed as the star dies and grows as things stick to it in the interstellar medium. Dense dust clouds are opaque to visible light and can completely hide background stars. For less dense clouds, the capacity of dust to preferentially reflect blue starlight becomes important, effectively blooming the stars blue light out and marking the surrounding dust. 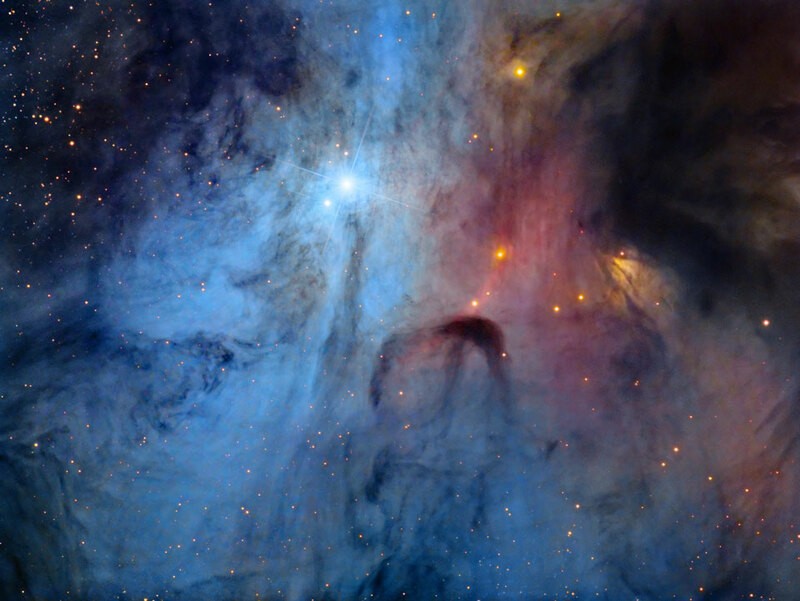 Nebular gas emissions, typically brightest in red light, can combine to form areas seemingly created on an artist's canvas. Photographed above is the central part of the nebula IC 4603 surrounding the bright star SAO 184376 (actually 8th magnitude) which mostly illuminates the blue reflection nebula. IC 4603 can be seen near the very bright star Antares (1st magnitude) toward the constellation of Ophiuchus.